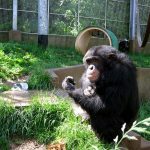 The Primate Rescue Center is home to two groups of rescued chimpanzees: seven youngsters who arrived in 1996 from New York University’s Laboratory for Experimental Medicine and Surgery in Primates (LEMSIP), which was preparing to shut down, and four elderly survivors of the “Dahlonega 5,” who were rescued in 1998 from a private situation in Georgia in which they had spent decades in squalid conditions. One of the PRC’s proudest accomplishments is the unification of these two groups, in the summer of 2000. 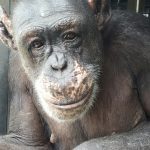 Before the introductions, the adults typically spent their days lazily grooming and napping, while the LEMSIP chimps displayed youthful energy and rambunctiousness. But as the two groups were united into one cohesive unit of eleven, more resembling the social dynamic of a natural troop in the wild, the once-sedentary adults began running, playing, and reprimanding the youngsters for inappropriate behavior. And those youngsters benefited, as well, as the integration enabled more complex interactions and social opportunities. 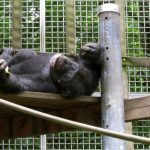 The LEMSIP chimps are now young adults, and we watch with endless fascination as the males jockey for position in the group’s hierarchy, some of them clearly angling to one day try to claim the alpha spot. 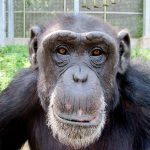 Because a chimpanzee may live 50 or more years in the wild, and even longer in captivity, whoever does ascend to that role may have a long reign as leader of the pack. The drawings below are taken from portraits by artist Alan Li, who spent months living and working at the PRC. More of his work is on display in our Alan Li Gallery. Victoria came to the PRC in 1998—along with Debbie (now deceased), Donald, Hazel, and Zulu—from Dahlonega, Georgia. Jenny was born on May 19, 1995, at LEMSIP, a former biomedical research laboratory in New York. Separated at birth from her mother. 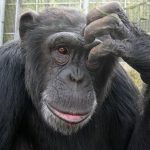 Donald’s exact age is a mystery, since pet chimps were usually wild-caught in the 1960s and early ’70s, rather than bred in the United States. Martina was born on January 21, 1991, at the Laboratory for Experimental Medicine and Surgery in Primates (LEMSIP). Ike was born on June 6, 1994, at LEMSIP, a former biomedical research laboratory in New York. Like many chimpanzees bred for research.